Guitarist Dustie Waring, of the NC based progressive metal band Between The Buried And Me, worked closely with Mojotone to create his extremely versatile signature pickup, the 'DW Tomahawk'. Dustie knows that heavier music has plenty of delicacy and requires a pickup that can aid the guitarist in achieving this. We use a custom blend of Ceramic and Alnico magnets along with our special winding technique to give the 'DW Tomahawk' the power and big bottom end of a high output humbucker while breathing with the clarity and articulation of a vintage humbucker. The 'DW Tomahawk' is a one of a kind, passive, high output humbucker, designed to have more clarity without muddying up or compressing your sound like most other high output pickups. So forget about what you've heard with other high output humbuckers and take a look at the 'DW Tomahawk.' 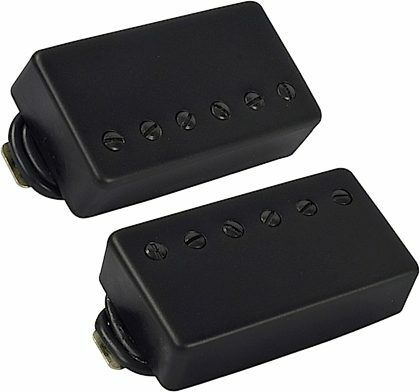 This is a fresh take on high output humbuckers that won't leave you disappointed or uninspired. - Hybrid magnet design utilizing a blend of Alnico and Ceramic for more dynamics and clarity. - High output bridge position without the mid hump or compression of a typical high output passive humbucker. - Clear neck position with lots of articulation and warmth for cutting lead tones and smooth clean tones. - Full and powerful coil tapped tones. - Extremely good string separation for chords and leads.